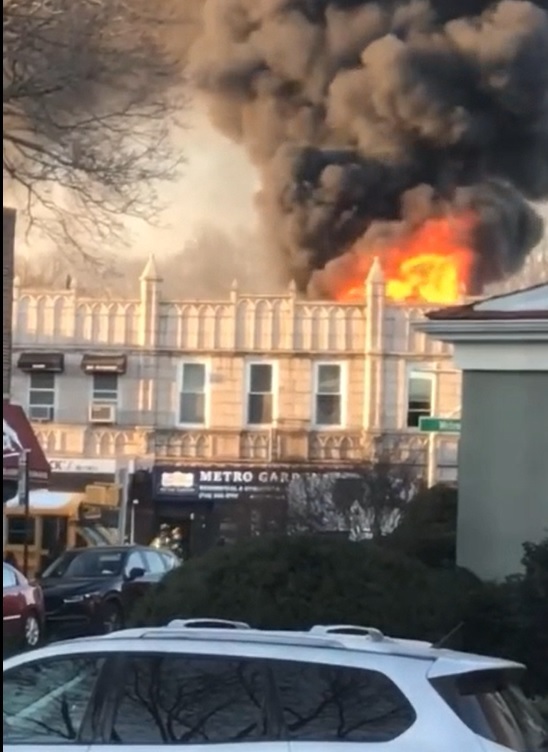 A fire broke out early Tuesday morning inside a two-story building on Metropolitan Avenue, according to the FDNY. The FDNY received a call at 7:13 a.m. that a fire had erupted inside 104-18 Metropolitan Ave. The building is home to Metro Garden Real Estate and Accounting Firm on the first floor and an apartment upstairs. FDNY said that 25 units and 106 firefighters responded to the scene where the fire was brought under control by 8:15 a.m. There were no civilian injuries but one firefighter suffered a minor injury and was treated at an area hospital, FDNY said. I’m so sorry to hear that there was a fire, living near the neighborhood and I wasn’t aware. My prayers go out to all who have been affected by this situation. Love and Light. Shame it wasn’t the abandoned Sizzler or the End of Century bar. Thank you for posting the video. My mother lives in the apartment unit next door. Very scary ordeal but thankfully no one was hurt. Thank you to the Firefighters that responded who helped my mom. Crysthal – I’m glad your mom is okay and nobody got hurt. I don’t understand why there are so many thumbs down. Did these people WANT people to get hurt? My question exactly. Those of you putting a thumbs down, explain yourselves, if you have the courage and decency.